Bhabha Atomic Research Centre (BARC) invites application for the post of 12 Nurse on Adhoc basis. Educational Qualification : 12th Standard and Diploma in Nursing & Midwifery (3 years Course) plus Registration as Nurse with M aharashtra Nursing Council or B.Sc. 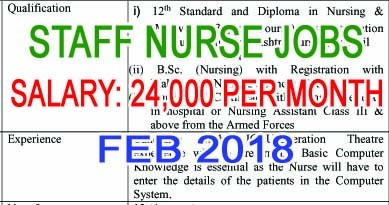 (Nursing) with Registration with Maharashtra Nursing Council; OR Nursing ‘A’ Certificate with 3 years experience in hospital or Nursing Assistant Class III & above from the Armed Forces. How to Apply BARC Vacancy : Interested Candidates may appear for Interview along with one set of attested Xerox copies as well as original certificates of date of birth, educational qualification & One passport size self photograph at the time of Interview. Venue Of Interview : Conference Room, Ground floor, BARC Hospital, Anushaktinagar, Mumbai 400 094.